In a federal courthouse in downtown San Diego on Tuesday morning, a defense attorney argued that the U.S. district court's implementation of the fast-track prosecution program known as Operation Streamline violates the 14th Amendment to the U.S. Constitution by creating a separate misdemeanor courtroom solely for non-citizens. Kara Hartzler of the non-profit Federal Defenders of San Diego was appealing the case of Oscar Chavez-Diaz, a Mexican citizen, who was one of the first people charged under Operation Streamline after he was arrested near the border on July 11. Just two days after his arrest Chavez-Diaz was allowed to plead guilty to illegal entry in a courtroom filled exclusively with other people being charged with the same misdemeanor. Operation Streamline was put in place this summer by Barry Moskowitz, the chief judge for the U.S. District Court for the Southern District of California, following an upsurge in illegal entry prosecutions by the U.S. Attorney's Office under the Department of Justice’s “zero tolerance” policy, which has aimed to criminally prosecute everyone who crosses the border unlawfully. Since it was implemented in San Diego, federal public defenders have been objecting to the entire judicial process surrounding the expedited, mass prosecutions. But Tuesday’s arguments reflect the first major challenge to the constitutionality of Operation Streamline, which federal defenders believe is a violation of the Constitution's "equal protection” clause. Other defendants charged with federal misdemeanors are handled together in a separate courtroom, and rarely face any jail time (the maximum penalty for illegal entry is 60 days). 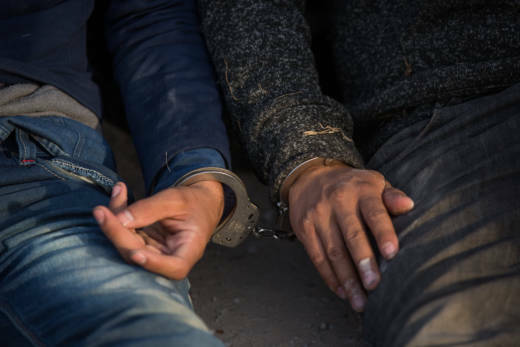 “There is no justifiable reason that we are treating people who are charged with illegal entry under a separate process and a separate court where they're not given the same rights and benefits as people in a regular court,” Hartzler told The California Report. District Judge Anthony Battaglia disagreed with the argument, however. After Hartzler spoke, Battaglia delivered his decision, reasoning that “the ‘processing’ of defendant’s case by charge is not discriminatory." Reading aloud from his ruling, Battaglia found that the court has the responsibility to schedule various criminal offenses in the way it sees fit, and that, even in the case of the separate Operation Streamline court, "in no way does alienage play a part." Still, Hartzler was encouraged by the judge's order, as she believes it will help her office's appeal of this case to a higher court. The irony of arguing an "equal protection" case, which stems from the 14th Amendment, on the same day the president openly questioned that amendment's validity, was not lost on Hartzler. “The 14th Amendment is the backbone of our Constitution,” she told the California Report. “And to have an assault on it by going after birthright citizenship, or by denying equal protection on a protected basis, whether its one camp or the other its still a violation."